Amphetamine is a prescription CNS stimulant commonly used to treat attention-deficit hyperactivity disorder (ADHD) in adults and children. It is also used to treat symptoms of traumatic brain injury and the daytime drowsiness symptoms of narcolepsy and chronic fatigue syndrome. The molecular formula for the Ampetamine molecule is C9H13N. Initially it was more popularly used to diminish the appetite and to control weight. Brand names of the drugs that contain amphetamine include Adderall and Dexedrine. The drug is also used illegally as a recreational club drug and as a performance enhancer. 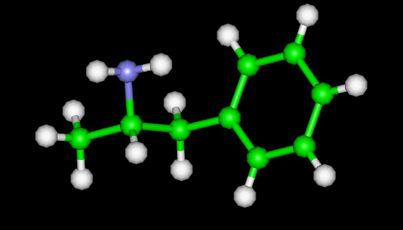 The name amphetamine is derived from its chemical name: alpha-methylphenethylamine. The name is also used to refer to the class of compounds derived from amphetamine, often referred to as the substituted amphetamines. The related compound methamphetamine was first synthesized from ephedrine in Japan in 1918 by chemist Akira Ogata via reduction of ephedrine using red phosphorus and iodine. The German military was notorious for their use of methamphetamine in World War Two.It is also known that Adolf Hitler was receiving daily shots of a medicine that contained certain essential vitamins and amphetamines. The German pharmaceutical Pervitin is an oral pill of 3 mg which was made available in 1938, but by mid-1941 it became a controlled substance, reportedly because of the amount of time needed for a soldier to rest and recover after use. Military doctors were then given guidelines on how they should issue it.